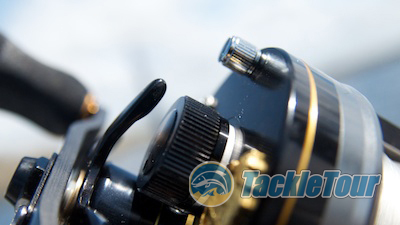 Power: There's a bit of a myth out there that round reels are more powerful than their low profile counterparts. They might feel more rigid because they're typically all metal in construction, but the gears and innards of reels in both styles are very similar. 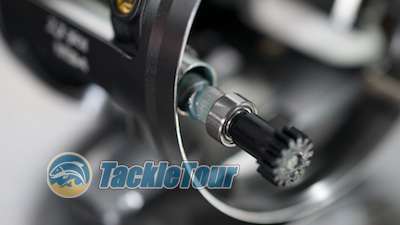 In fact, given how most manufacturers now drop and enlarge the gear box in low profile reels, one can argue many low profile reels are more powerful. The Morrum's gear box is not terribly oversized as compared to its low profile siblings in the third generation Revos. The Morrum does have a small protrusion at bottom of its handle side to house the reel's gear, but it's no where near as large as that on it's Generation 3 Revo cousins. Actual power of this reel is about what I expected - good for general purpose use, but not a lot of leverage for extended use in tasks like a dedicated reel for deep diving cranks. 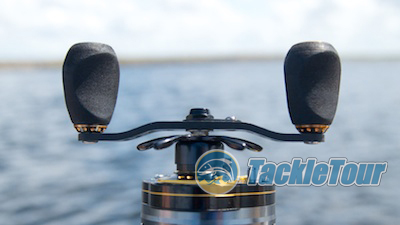 It works ok for these tasks, but there are better choices for dedicated deep cranking (like the Revo Winch). 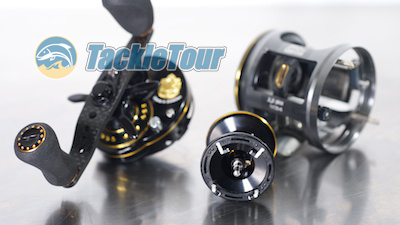 A little modern twist on this reel is the swept handle design at 90 millimeters in length. Casting Range: In order to test the low end casting range on the Morrum ZX 3601, I had to mount it on a different stick. While the F7-71X7 Aaron Martens 71 is a great stick, it's hardly the rod I'd choose with which to present lighter baits. Instead, I pulled out a Phenix PHX-682C. Matched with this rod, I was able to present baits down to roughly one quarter (1/4) of an ounce although given the line I was using (12 Seaguar Tatsu), three eighths (3/8) of an ounce felt a lot more natural. Here's a look at the IVCB-4 flying brake arms on the spool. 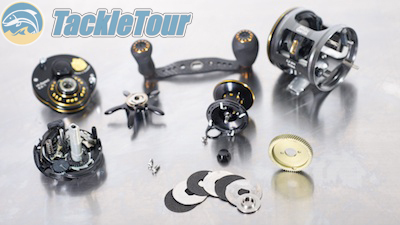 Brakes: The Morrum ZX 3600/3601 comes equipped with Abu Garcia's Infinitely Variable Centrifugal Brakes 4 (IVCB-4). I've fished this same braking system on the Revo MGX and really liked the way it performed on that reel so had high hopes for the Morrum. I wasn't disappointed. Access to the spool is made by lifting the handle sideplate off the frame held in by two of these silver knobs/screws. There are four centrifugal brake arms on the Morrum's spool that moderate the spool's speed via friction against a brake panel located on the inside of the non-handle sideplate. 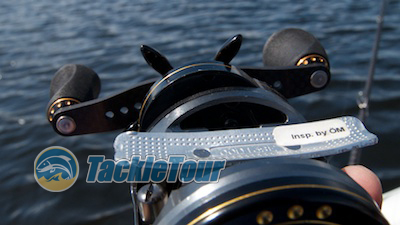 This sideplate moves into and away from the center of the reel by turning the external dial. The further in that panel is moved towards the spool (turning the dial counter clockwise on the 3601), the greater the friction from the flying brake arms, the more brake force you incur. The swept, 90mm handle is made of carbon fiber. 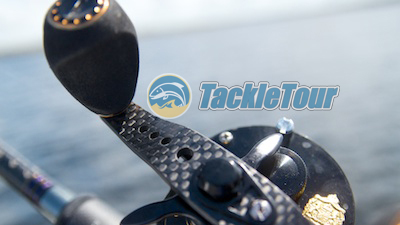 When all is said and done, it's a seemingly simple yet very effective braking system that allows for very free and far casts when adjusted properly. The brake panel moves very slowly so the degree of adjustment allowed is quite wide hence the use of "infinitely variable" in the system's name. The levelwind wormgear is supported by one bearing. Features: Looking through the standard set of features we score, the Morrum comes with the afore mentioned externally adjustable casting brakes, one bearing on the levelwind, two bearings per knob, micro-click adjustments on both the dragstar and cast control knob, and oil in the box. Really the only thing missing off our checklist is a reel cover. This is a very simple reel to break down. 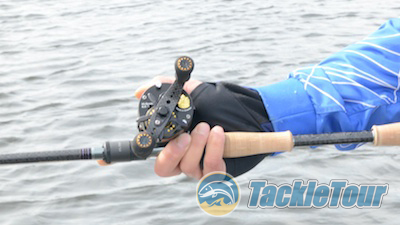 See how small this reel is in hand?